Note: Some technical ability is required to carry out the instructions in this article. If you are unsure how to access your domain's DNS, or how to make these changes, just let us know via Intercom and we can help. When you first get started with Syngency, all emails sent from your account – whether they're packages, invoices, booking confirmations, etc. – are sent on your behalf from a mailer@syngency.com email address. Your name is still used in the From field, and the Reply To is your email address, but the actual email comes from this address. Because of this, emails can often be caught by spam filters or by junk mail rules, as many servers don't trust an email that has different From and Reply To addresses. By adding a small change to your email domain's DNS record, Syngency is able to send email using the same domain name email address you use in your email program, which avoids a lot of these issues. Follow the steps below to do this. 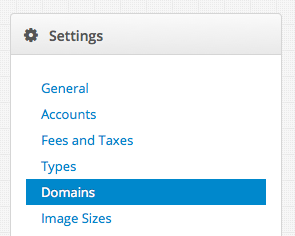 Once it appears in the list, click the checkbox in the Email column so set it as your email domain. You will see an activity indicator appear briefly, before a code appears in the Validation Code column. You will want to copy this code to your clipboard. The exact procedure for this next step will vary, depending on the company you use to host your email domain. This could be GoDaddy, Register.com, NameCheap, or any other. If you need help, we recommend passing the link to this article to one of your domain registrar's support team, and they can help you with these steps. and the Validation Code you copied from Syngency as the value. Once you have done this, you will need to wait up to an hour for Syngency to update, and you will then see a check mark in the Verified column of the domain list. Once this appears, Syngency will send all email from your email domain, and it will be "trusted" with other email servers.